Green Mountain Power(GMP) is a wholly-owned subsidiary of GazMetro of Quebec. GMP has applied to the Vermont Public Service Board for permission to take over Central Vermont Public Service: Docket 7700. If GMP owns CVPS, over 70% of Vermont will be served by a utility owned by Gaz Metro. Since Gaz Metro also owns Vermont Gas Systems (VGS), the only natural gas supplier to Vermont, this electric utility merger would be a major consolidation of Vermont energy infrastructure (electric and gas) in the hands of a foreign corporation. To me, this is very different from Unilever owning Ben and Jerry's. There are other sources for ice cream in Vermont. With the Gaz Metro takeover of GMP, there will be no competing sources of energy in most areas of Vermont. Governor Peter Shumlin favored a Gaz Metro takeover of CVPS, discouraging a bid from another Canadian utility. In analyzing the ramifications of this possible merger, I feel it has three over-arching issues. Foreign ownership of much of the energy infrastructure in the state. Weak regulation and conflict of interest in Vermont's own regulatory process. I covered the first two issues in an article this morning at True North Reports: The GMP/Gaz Metro merger. I plan to cover the third issue: weak regulation and conflict of interest, in a future article at True North Reports. This morning, Vermont Digger published an article about the conflict of interest issue in Vermont, which is being energetically pursued by Senator Vince Illuzzi. The Commissioner of the Department of Public Service, Elizabeth Miller, is married to a lawyer who is a partner in the law firm representing GMP in the merger. The Vermont Digger article is Before the PSB: State senator leverages fight over independent counsel for Gaz Metro merger. I encourage you to read it. The DPS says Ms. Miller does not have a conflict that would cause her to recuse herself. The Digger article is excellent, with many links to original documents, such as the DPS answer to Senator Illuzzi. I recommend this article very highly. When I write my own article (promises, promises) I also plan to cover recent Public Service Board decisions that protected utility and Gaz Metro interests, and did not protect the citizens. The charter of the DPS is to be the advocate of the ordinary citizen in cases before the PSB. DPS is not fulfilling to that charter, in my opinion. John McClaughry, head of the Ethan Allen Institute, was one of the first to raise the issue of infrastructure consolidation and conflict of interest, in his Vermont Tiger post Sen Illuzzi and the Utility Merger Case. 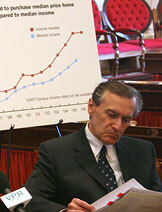 The picture of Senator Illuzzi is borrowed from that post. On November 30, the film Transparent Radiation will be shown at the Gund Institute of the University of Vermont. The film is about nuclear energy, but the trailers also show nuclear bombs. The trailers also include people talking about how depleted uranium will be radioactive for billions of years. As will granite, of course! Howard Shaffer learned that there would be a panel discussion of the film, and asked to be on the panel. Actually, Howard asked if he and Dr. Ed Maher, recent past-president of the Health Physics Society, could be on the panel. They are now on the panel, along with Arnie Gundersen and others. Arnie Gundersen's wife, Maggie Gundersen, endorses the film very strongly. I am happy that Howard and Ed will be on the panel. However, considering both the venue and the film, I thought it would be good to tell pro-nuclear people about this event, in the hopes that some of us could come and support them. I wrote an email to my email list about it. Rod Adams is on the email list, and Rod posted my email on the Atomic Insights blog today: Nuclear Advocacy Opportunity in Vermont--November 30. I hope some of you can come. The film and panel begin at 4 p.m Wednesday November 30 on the UVM campus. The event is being held in the administration building, which has a visitor's parking lot. Details at Rod Adams blog. Thank you, Rod! Update: A press release at Vermont Digger. Neither rain nor snow nor Thanksgiving weekend stops the Nuclear Bloggers from their work. Today, the 80th Carnival of Nuclear Bloggers is hosted at Next Big Future. Okay. I admit it. It's a smaller Carnival this time. That just means you can read it more quickly! The Carnival includes a fascinating blog post by Will Davis of Atomic Power Review on the history of PRA (Probablistic Risk Assessment). If you ever wondered what that was, but had your eyes glaze over as it was explained, this is a must-read post. Dan Yurman at Idaho Samizdat describes the concrete cracking problems (solvable) that are delaying restart at two reactors. Gail Marcus of Nuke Power Talk has two posts, one about Japan's hundred-year energy plan, and one about polls about nuclear power which show support--even in Japan. Brian Wang of Next Big Future looks at anti-nuclear Chris Busby, who is selling "anti-radiation pills" in Japan (really!). Wang and environmentalist George Monbiot suggest that nuclear opponents run as fast as they can to distance themselves from this guy! Wang notes that the Fukushima reactors are nearing cold shutdown. Wang also includes two radiation surveys of Japan. One, of Fukushima workers, shows no contamination. The other, of the soils in Japan, shows contamination in some areas which must be addressed before these areas can go back to food production. Most of the radiation in one area was emitted on March 15, and in the other area, radiation came March 21. This is not cheery reading. On the other hand, the "on-going spewing from the crippled reactors" scare-mongers are just wrong. Bad things happened in March. We all noticed, and now it is time to clean up. 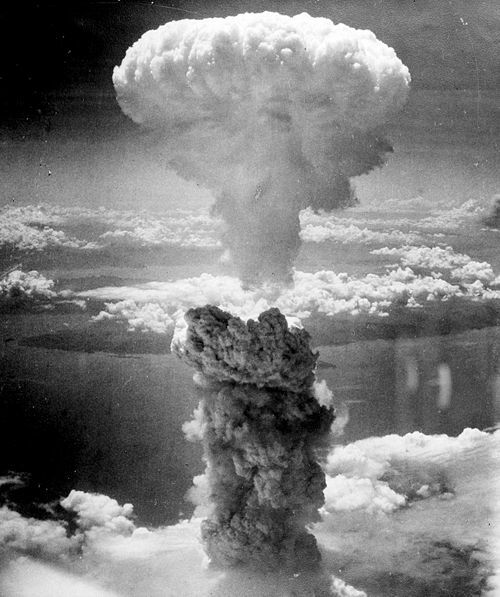 Nagasaki bomb image from Wikipedia. Bomb imagery is included in some of the film trailers. Labels: Blog Carnival, Gundersens, Rod Adams, transparent radiation film. On November 22, a letter about Vermont Yankee appeared in the Brattleboro Reformer. This letter was unusual, because it was sent by the Putney Society of Friends. As members of the Religious Society of Friends, we believe we are called to be good stewards of the earth. 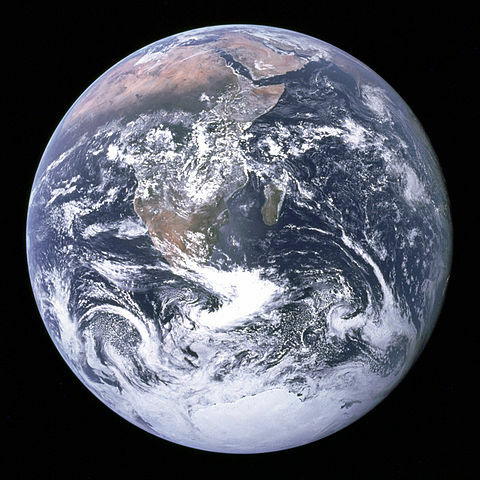 Whether through weaponization, accident or mismanagement, the destruction of life and the degradation of nature has been, and continues to be, an ongoing consequence of the use of nuclear technology. As a result of these concerns, Putney Friends Meeting firmly supports the Vermont state government’s efforts to close the Vermont Yankee nuclear power plant by March 21, 2012. We call on all our members and attenders to consider joining the citizen’s movement working to enforce the people’s will on this matter, up to and including nonviolent protest and civil disobedience. We are made to be an integral part of this wondrous Creation. Let us choose now to take up our stewardship commitment, fully accepting our responsibilities to care for our planet and its peoples. Let us choose now to join with other Friends, and all people of good will and understanding, to move forward through worship and through witness to accomplish our goals. However, I do have a friend who is a Friend. 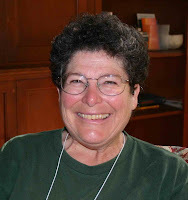 Karen Street writes the blog A Musing Environment, and she and I have had friendly discussions on this blog about energy use. We don't always agree. Street wrote an excellent article in the Friend's Journal about nuclear power. She's in favor of it. The article is Earthquake, Tsunami and Nuclear Power in Japan. Here's a few quotes from that article, and I would also recommend reading comment 11, which is her rebuttal to some comments on the article. Fear of other can obscure and distort our perceptions of actual risks. For better or worse, one doesn't have to seek sources of risk in one's own behavior when there is a convenient other to blame for untoward outcomes, such as callous scientists and industry, inadequately regulated by government....Nuclear power plays a pivotal role in the we-good, they-bad fights among many Friends...While we steep ourselves in fears of what might happen at a nuclear plant this month or next, the climate continues to change at a frightening rate....A fear that says, "Well, nuclear power may end up killing someone" is, in this way of thinking, allowed to take precedence over far greater dangers to human beings. Any fear that says, "My fear is more important than the facts," a fear based on "what ifs," blinds us to steps that would address real and present dangers. Her article is very carefully researched. The article, combined with comment 11, is a good resource for anyone studying nuclear power. It is also fairly long. If you don't feel like reading it (or even if you do) I recommend this Friend's radio program interview instead. You can hear Street's kind and thoughtful voice, and think about what it means to be a Friend or a friend or an environmentalist. Here's a link to Street at Northern Spirit Radio. You don't have to sign in, by the way. They want you to sign in, but you don't have to. Separation of Church and State means that the State can't favor any particular Church. However, churches can definitely take stands on matters of state. This is the way freedom works. Still, I was not happy to see a church taking "shut down Vermont Yankee" as a religious injunction. Karen Street is a woman who owns no car, rides a bicycle, does not travel by plane, and is concerned with the future of mankind. As I mentioned before, she walks the talk about environmentalism and climate change. Through Karen Street, I see that the Society of Friends is not monolithic, and I am grateful for that. Update: Karen Street has an excellent update on her post, at Energy Collective today. The Discussion Continues: Nuclear Power in Japan. Street answers the questions raised as comments on the first post. "At today's [natural] gas prices, a new nuclear power plant is out of the money by a factor of two," Rowe said, echoing one of the main points of his speech. ".... It's economically wrong. Gas trumps it," he said. Entergy became the first US electric power company to establish a voluntary stabilization target for carbon pollution emissions and established a $30 million Environmental Initiatives Fund to support internal and external carbon pollution reduction projects. From 2001–2010, Entergy was 14% below its stabilization goals, achieving emission reductions which were 69 million tons below the goals. These CEOs have very different views of the future of fossil fuel combustion! However, both Leonard and Rowe are CEOs, with CEO-type obligations. Rowe of Exelon faced building an expensive new nuclear plant, and he walked away from it. While he was walking away, he took the opportunity to lob a few cracks at nuclear. Meanwhile, Entergy is committed to low-carbon power, but Entergy recently announced it is going to buy a 550 MW natural gas plant in Rhode Island. Both Entergy and Exelon own fossil and nuclear units. Such is the view from the corner office. My own office is a corner. It's a corner bedroom in my house. My view of fossil fuels and nuclear is more limited than the view of the CEOs, but it is also less constrained. I have always admired George Washington Carver, a man who protected the soil of the South and prepared many products from peanuts, thereby partially weaning the South from cotton. Oh, and did I mention he was born a slave? Inspired by Carver, I decided to look at two power plants as the examples of nuclear and natural gas: Vermont Yankee and a local combined cycle gas turbine (CCGT) plant in New Hampshire. Not a Big Picture, just two plants. My blog post comparing the plants is posted at ANS Nuclear Cafe: Gas and Nuclear: A Comparison of Two Local Plants. The post grows out of the Energy Safari course that just finished. 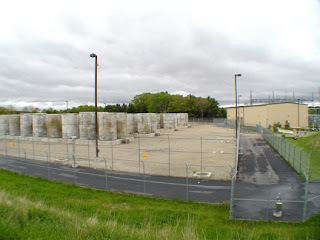 Here's a link to the course blog post about the natural gas plant. The course blog post has many excellent pictures, taken by Bob Hargraves. Here are some conclusions about the two plants. For a more complete picture, please see the ANS post and the Energy Safari post. The natural gas plant is very new, clean and efficient. The economic choice between natural gas and nuclear is not a slam-dunk, even if Mr. Rowe thinks it is. Despite the historically low price of natural gas, and the high thermal efficiency of the CCGT plant, the local gas plant is still forced to shut down more often than it would prefer. Its power is among the most expensive power on the grid. Many times, its break-even price is too high for the grid, and the grid operators don't buy its power. The CCGT is a good plant for load-following. Choosing between natural gas and nuclear is a false choice, anyhow. They are both reliable sources of electricity. Fossil fuels, including natural gas, contribute a lot more to global warming than nuclear does. Despite all the hoopla about global warming, this is not usually taken into account in power choices. I encourage you to read the ANS blog post, and tell me what you think of my view-from-the peanut. Think locally, act locally, perhaps? 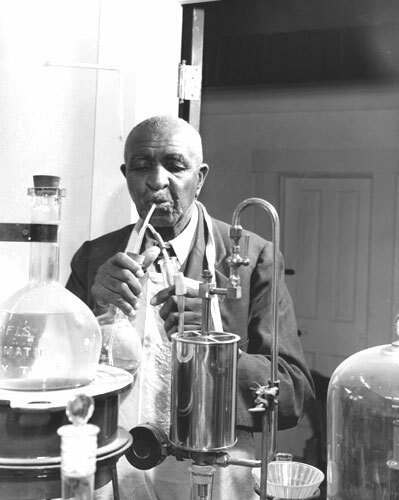 George Washington Carver in his laboratory, photo from Wikipedia. I just finished Tent Life in Siberia, a tale of traveling through Siberia in the 1860s. The author writes like Mark Twain, with a similar sense of humor. I dare anyone to read this book without laughing out loud. 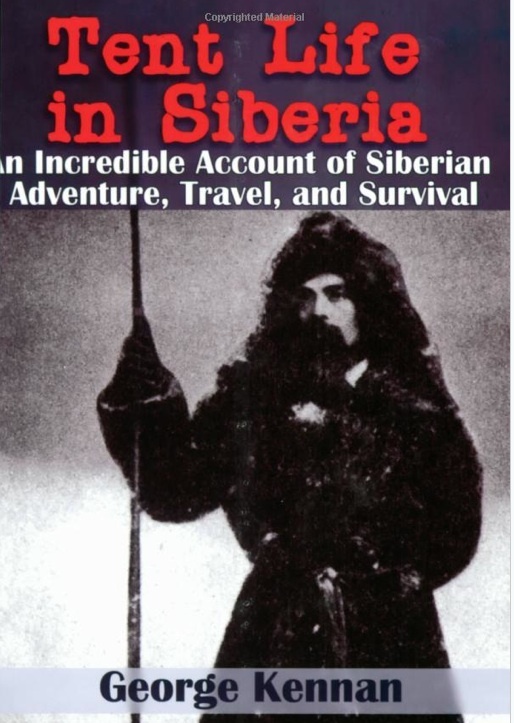 Despite the humor, this is a book about--traveling in Siberia in the 1860s. To instill gratitude for absolutely everything in your life, I can't think of a better plan than sitting down to read this book. 2) I have a washing machine, and before I owned one, I used a laundromat. For this, I recommend Roslings' video, below. Why energy availability matters, especially to women. We just returned from a trip to California, where we used to live. This trip gave us another opportunity to realize how grateful we are for our long-term friends. K and K, this means you! The 79th Carnival of Nuclear Bloggers is now posted at ANS Nuclear Cafe. Dan Yurman has put together a fascinating Carnival. Let's start with Nuclear Green's contribution: a three- part interview with Sherrell Greene, a recently retired ORNL reactor researcher. Greene describes several types of new reactors, including several molten salt reactors, and point to the problems of "business as usual" in the nuclear industry. 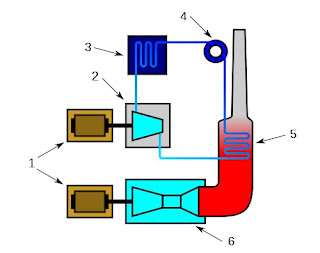 We need to develop new types of reactors! In a similar vein, Brian Wang of Next Big Future describes new types of uranium/thorium fuel under development, and third generation reactors on order in China. 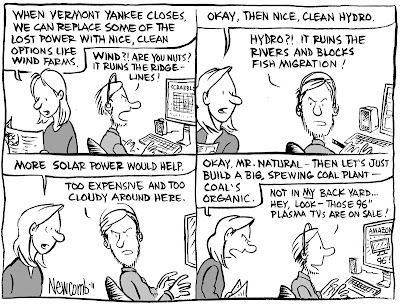 In several cheerful notes, both Gail Marcus and I enjoy a pro-nuclear cartoon from a Vermont newspaper. (Yes, you read that right. Pro-nuclear and Vermont newspaper appeared in the same sentence.) Dan Yurman at Idaho Samizdat explains how the next generation of nuclear engineers will have been raised on computer games---and that's a good thing. Gail Marcus of Nuke Power Talk describes the positive effects of Russia's interest in joining the international Nuclear Energy Agency (NEA). In 2006, Marcus headed an NEA delegation to Moscow to sign preliminary papers about cooperation, and that effort is bearing fruit. Good going, Marcus and NEA! Meanwhile, Rod Adams of Atomic Insights reports the good news that reporters are now allowed to visit Fukushima Daiichi. This shows great progress in the clean-up. Rod also reports that USA Today managed to turn this into a bad-news time-to-worry story. Steve Aplin of Canadian Energy Issues wonders why the Occupy protesters in Ottawa are using gasoline powered diesel generators. Pretty dirty electricity. They could connect batteries to the clean Ottawa grid instead. Three quarters of the grid's power comes from non-emitting sources of nuclear and hydro. At ANS Nuclear Cafe, Dan Yurman reviews the issues and consequences of the anti-nuclear protests in India. Let's see. The national government is pro-nuclear, some of the provincial governments are anti-nuclear, and nobody told the people in the area of one plant that the siren-test-evacuation drill was a test. So local citizens were terrified as they heard sirens and saw people streaming from the plant grounds. India is a complicated place, goodness knows, but the nuclear start-up could also be far better organized. Excellent post on an important subject. News and views and updates from all over! Come to the Carnival! I am one of the Page Owners of the Save Vermont Yankee Facebook Page. It is visible just to the right, on this blog. If you are on Facebook, please Like us! You can Like us without even leaving the Yes Vermont Yankee blog site. On the Facebook Page, we often post web links that are interesting or amusing or relevant to energy issues in Vermont. Very few of these links ever make it to a Yes Vermont Yankee blog post. I am trying an experiment today. I am going to post a few of the links that were placed on the FB Page last week. If readers like this, I will try to post some links most weekends. Let me know what you think. Vermont Yankee and Vermont History: Letter in the Reformer. Our economy is in the toilet. Last time this happened in Vermont, about fifty years ago, we climbed out of recession by voting to build Vermont Yankee. Germany faces sticker shock as renewables replace nuclear. A dozen coal-fired plants will also be built. Environment News Service. An attempt to read the Vermont Comprehensive Energy Plan. Letter in True North Reports. The letter-writer struggles along, reading the report, but can't make any progress on figuring out how much all those renewables will cost. States and States Rights in Vermont. VPR interview with McQuiston. Killington couldn't secede from Vermont, and Vermont can't regulate nuclear safety. Timothy McQuiston is editor of Vermont Business Magazine. 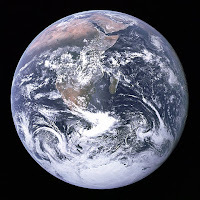 The earth as seen from Apollo 17. Wikipedia I'm linking to the World Wide Web, so I show the world. I thought of sausage links as a graphic, but this is prettier. Labels: facebook, general links. prejudice against VY employees. In general, I make the optimistic (and I believe correct) assumption that Vermont Yankee will continue to operate until 2032. However, opponents like to talk about the "jobs bonanza" of decommissioning. This blog post looks at the facts of decommissioning. It is updated from a post I did about three months ago at True North Reports. A company has two main choices for decommissioning a nuclear plant. Prompt decommissioning: starting the decommissioning project as soon as the plant is closed. SafStor: keeping the plant intact for many years, until decommissioning is more convenient. In the video below, posted by Vermont Digger from Shumlin's press conference on August 11, Shumlin explains that SafStor (delayed decommissioning) wasn't part of the Vermont Yankee purchase agreement, no matter what papers the state signed, and no matter what words somehow sneaked into those signed papers. The jobs gap doesn’t really happen for about 16 years,” he said. “Five to six years for the plant to cool down, gotta keep all the systems running, that requires a number of employees, several hundred. And ten years of decommissioning. So the jobs cliff, despite what they tell you in those 30 second advertisements, is not as significant as long as they keep their promise on decommissioning the plant whenever it shuts down. Unfortunately, the facts do not agree with Shumlin's optimistic statements. There is a jobs cliff. Shumlin does not believe that Entergy has the right to put Vermont Yankee in SafStor. You can see this in this in the video clip above, and I also described Shumlin's misconception about SafStor in my post In Vermont Our Word is Our Bond, So We Don't Honor Contracts. But Entergy can legally use SafStor, whether Shumlin believes it or not. What will happen if they choose to use it? Many nuclear plants have been put in SafStor. Usually, an older reactor at a site is put in Safstor while newer reactors at the site continue to operate. At Indian Point, for example, the small Unit 1 reactor (274 MW) has been in SafStor since 1974. Meanwhile, Unit 2 and 3 reactors, around 1000 MW each, continue to operate. However, stand-alone plants are also placed in SafStor. For example, the Zion plants in Illinois have been in SafStor since 1998 and they are now beginning decommissioning. In the case of Vermont Yankee, the plant would be put in SafStor while the decommissioning fund (now around $490 million dollars) grew to a larger amount. Meanwhile, the radiation at the plant would decrease, leading to a less expensive clean-up. Shumlin is correct about one thing, however. SafStor does not require many staff people. The site must have security, the fuel pool must be maintained and monitored, and the rest of the system has scheduled inspections. SafStor generally requires a staff of around 100 people, instead of the 650 at Vermont Yankee now. With SafStor, around 80% of the staff at VY would be laid off within a year of shutdown. No further staff would be needed until decommissioning began, which could be many decades in the future. Clearly, SafStor is a "jobs cliff", and Entergy can choose to use it. But what if Entergy chooses prompt decommissioning? This is the option Shumlin wants Entergy to chose, if the plant is shut down. Shumlin says that it would take "five or six years for the plant to cool down" while hundreds of employees monitor it. Shumlin's tale is cheerful but wrong. With prompt decommissioning, the staff at the plant is laid off as soon as possible. The biggest controllable cost in decommissioning is manpower... However, the plants that have been slow to efficiently accomplish...downsizing [the workforce] have had higher decommissioning costs....Severance packages, early retirement, and worker transition services helped workers make the transition. The major downsizing occurred over about a three month period. With SafStor, most plant people lose their jobs within six months. With prompt decommissioning, it takes two years to downsize to a skeleton staff. Shumlin says decommissioning includes hundreds of people keeping their jobs for many years, but that is not the case. Another advantage to early and aggressive downsizing is that it opens up opportunities to bring in workers with skill sets that are more suited to a decommissioning environment. Also, if these workers are contractors, they tend to be more accustomed to completing a given scope of work and moving on to another job. How many contractors? The number of people in the contract work force is hard to estimate because it varies as the job goes through various phases. Decommissioning activities are done on a subcontract basis, with various groups of contractors brought in and later terminated. Decommissioning is basically a construction (de-construction) project. Since radiological safety is important, the construction workers must follow protocols. However, the construction workers don't have the protocol-mindset of nuclear workers, and this can lead to problems. In the case of Maine Yankee, the company hired a general contractor to supervise the subcontractors, but then found so many problems that they terminated the general contractor. This has also happened at other plants. With SafStor or prompt decommissioning, there is a jobs cliff. The people at the plant are mostly gone within six months or two years. The decommissioning workers are not permanent employees, and not encouraged to think of themselves that way. Morale is often low, job security is non-existent, and well-trained people who have other options tend to leave town. Despite Shumlin's optimistic statements about "five years, then another ten years" it's all over for the regular employees within two years. The contractors do not become permanent residents of the area. The contractors come to town and then move on quickly. Decommissioning leads to an instant loss of jobs and community. An earlier version of this post appeared in True North Reports. I thank Rob Roper of True North Reports for permission to repost it here. 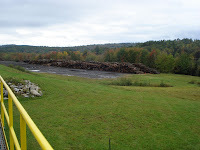 The picture of dry casks at Maine Yankee is from the 3yankees website about the decommissioned plants. Update: I thank Vermont Tiger for their good words about this blog post in Yankee, What If? The 78th blog Carnival of Nuclear Energy is posted at Next Big Future. Once again, Brian Wang has assembled a great collection of thought-provoking posts. Let's start with morals. Rod Adams of Atomic Insights described The "Moral Imperative to Build More Nuclear Power Stations" to increase prosperity for the growing world population. Meanwhile, Cool Hand Nuke reports on the Dalai Lama endorsing nuclear power at a press conference in Tokyo, directly after touring the tsunami-devastated areas of Fukushima. On the darker side of morals, Gail Marcus at Nuke Power Talk discusses a Japanese article about "sloppy inspection" of Japanese nuclear power plants, and compares Japanese practices with the better practices of the NRC. Most discouragingly, the difference between Japanese practices and U S practices have been known for years, in Japan and elsewhere. Marcus lived in Japan and worked with their regulators in the past. She knows whereof she writes. From morals, it's a quick leap to misconceptions about nuclear and renewables. Gail Marcus summarizes a recent study showing that using wind turbines could add to global warming, because ramping up gas turbines to provide back-up power is inefficient. Using gas turbines as backup produces more carbon dioxide per kWh than using the gas turbines on a steady basis. Wind will not solve global warming problems. NEI Nuclear Notes has two posts about misleading articles and statements: "CNN's Erin Burnett Hoodwinked by Erin Brokovich," and Entergy's response to irresponsible statements by Edward Markey about strontium in fish. Steve Skutnik of Neutron Economy dismisses some misconception about nuclear as he analyzes nuclear regulation, deregulation, and John Rowe's statements in favor of natural gas. Well, on to the good news! Economics. Dan Yurman at Idaho Samizdate shows that cash is flowing into new nuclear build projects. In another piece of cheerful news, NEI Nuclear Notes describes how France is sticking with nuclear power, in this age of austerity. Brian Wang of Next Big Future lists the new builds of nuclear plants. The Carnival includes his list of nuclear plants under construction and planned, based on the EAI energy outlook and the NEI nuclear update. 65 plants, totally 65,000 MW, are currently under construction, with 127 more plants in the planning stage. Okay, I know, I get encouraged and discouraged at the same time. Only one new build is happening in the U.S; the other 64 nuclear plants are in other countries. However, I remind myself the fact we're becoming a global back-water in nuclear (and a global leader in fossil fuel consumption) is old news. Overall, the list of new plants is very cheerful. Finally, we turn to the personal view of nuclear for a few more cheerful posts. At Yes Vermont Yankee, Evan Twarog writes a "Teen's View of Vermont Yankee" showing how plant workers support the town with their daily work and their volunteer work. Moving to events in Japan, Wang describes advances in worker safety at Fukushima in his Next Big Future blog. The Japanese workers are being assisted with robots originally developed to help the elderly. It's a great Carnival, and you will enjoy reading it. Several news stories and blogs have covered Vermont Yankee issues recently. Here's a quick catch-up from the past few days. The cartoon above is by Tim Newcomb and originally appeared in Seven Days. I thank Mr. Newcomb for granting permission to use it in this blog. At ANS Nuclear Cafe, Howard Shaffer covers the background of the opponent rally at the plant gates. The comment stream discusses the rise (and fall?) of the Clamshell Alliance. Senator Markey, a long-time foe of nuclear energy, wrote a letter to the NRC accusing them of letting Entergy get away with a lie about the "strontium fish". Here are two excellent blogs by Victoria Barq of NEI Nuclear Notes about Markey's letter (included in this blog post) and Entergy's response. Yesterday, Barq wrote a follow-up blog post about Entergy's response, including quotes from the Vermont Department of Health (no reason to believe the strontium in the fish came from the plant) and even quotes Governor Shumlin! Entergy has never detected any strontium in liquid releases or required environmental samples of groundwater, etc. Even Shumlin said we could not tell where the strontium came from! A very enjoyable post. It's great to see a solid response to unfounded, publicity-seeking attacks. In local news, Lochbaum joined in the fray on Markey's side, and my hometown paper, the Valley News, published a very misleading Op-Ed quoting Markey and Lochbaum: Entergy "Doublespeak." Howard and I are collaborating on a letter-to-the-editor in answer. For some background: I blogged about the facts and the fish in August. This blog also hosted a guest post by Richard Schmidt in September. His post compared mercury in fish (a real problem) with strontium at background levels. A letter on What It Means to Be a Nuclear Worker in the Commons, a Brattleboro paper. Any nuclear workers reading this blog might want to comment on it: the one comment so far is a plant opponent. Evan Twarog's letter (A Teen's View of Vermont Yankee, on this blog yesterday) was also published at True North Reports. Charles Barton's Nuclear Green Revolution blog ran Robert Hargrave's Vermont Yankee Explained animation. An enjoyable six minute video. The cartoon, by Tim Newcomb, heads this post! This letter to the editor appeared in the Brattleboro Reformer on November 4, 2011. Evan Twarog was kind enough to allow me to reprint it in this blog. Nuclear power ... Vermont Yankee ... all increasingly con­troversial topics today. But no matter what side of the aisle you rest on, if you live in Vermont or New Hampshire, you’ll be affected if Vermont Yankee closes. Do I know for sure what the future holds for Vermont? No, not me and certainly not anyone else. But I can take a look at the statistics to deter­mine what is most likely best for Vermont, and so can you. We all want what is best for Ver­mont, but we all have miscon­ceptions and it takes will-power to overcome them. If we all open our minds to listen to the other side of the argument, we will be in a much better position to make decisions. In order to be a true leader, you need to have the courage to do that. My dad works at Vermont Yan­kee. I’m incredibly proud of him. He’s worked tirelessly to get to the position he has now. He is a shift manager, and is in charge of operations at the plant when he is on shift. He is an incredibly smart man, and he wouldn’t have moved his family to this region if he felt that VY was in any way dangerous. On top of working 12 hour days and being a terrific father, he runs the Keene Youth Lacrosse Program. Many other employees of the plant are actively involved in other organ­izations as well. I understand that you might have negative feelings about the plant, but just try to put yourself in my shoes. Maybe you’ll see that my dad’s not the monster the media and anti-VY groups make him and the other VY employees out to be. I’ve always thought that good things happen to good people, but clearly life is not so simple. I’ve always given back to the community, pushed myself in school, and helped others. Every night my family wonders what we will do if VY does shut down. We have to live with the fact that if VY closes, we won’t have the life that we enjoy now. No one, let alone a kid should have to deal with that. My family’s story is only one story of more than 600. I have done the research, and I truly believe that Vermont Yan­kee is not only safe, but it is a reliable and clean source of energy. It is a major employer, which our area needs desperate­ly in these tough economic times. I am proud to be part of the VY family. 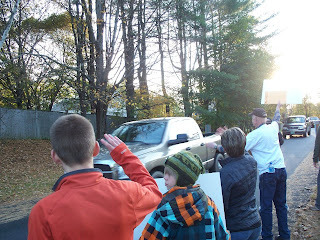 Evan Twarog appears in these two pictures of the Rally in support of Vermont Yankee on October 23. He is wearing a red jacket and appears with his mother and younger brother. I thank the Vermont Yankee Nuclear Power Plant Facebook page for allowing me to use these pictures. Governor Peter Shumlin of Vermont is in favor of replacing Vermont Yankee with out-of state and out-of-country power, and of course with renewables.The renewables part isn't going very well. The video below shows Peter Shumlin attempting to shake hands with people who are protesting the Lowell Mountain wind farms. Shay Totten of 7 Days Vermont included this video in his blog post Occupiers and Environmentalists Confronting Vermont Democrats. The post is worth reading. One interesting quote from the Totten article:"When Gov. Shumlin opposed Vermont Yankee, he was doing the right thing and we supported him. But then Green Mountain Power turns around and buys power from Seabrook [Nuclear Power] and he says nothing. Why not?" said Eric Wallace-Senft of Woodbury. Indeed, why didn't Shumlin object to buying nuclear power from New Hampshire? Probably because Governor Shumlin is learning some things about energy supply. In March 2010, Shumlin went on national TV and said that Germany got 30% of its electricity from solar. 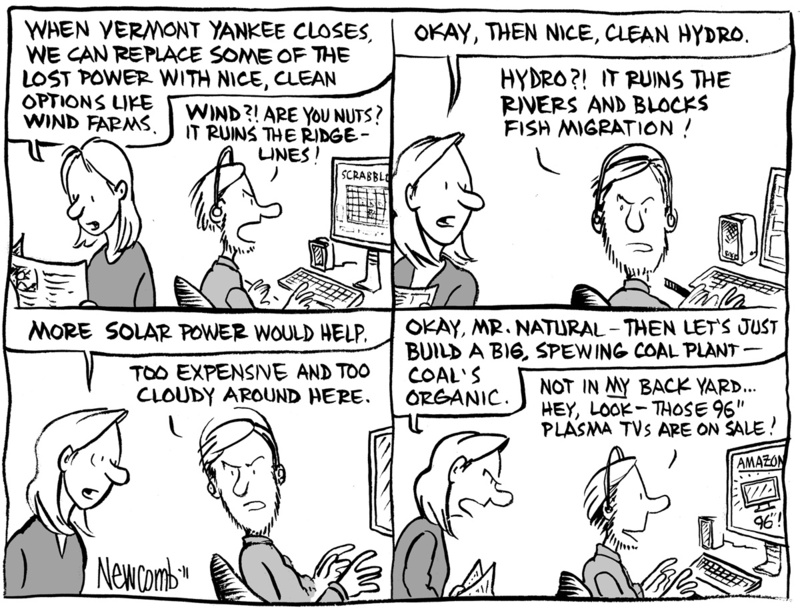 Now, a year and a half later, Shumlin may have learned the definition of baseload. Meanwhile, there are wind lawsuits. The most active one is about property rights. A retired couple, Don and Shirley Nelson, are neighbors of the Lowell Mountain Wind project. They don't like the project. The contractor for Green Mountain Power is blasting a road near Nelson's property, and wants to be sure nobody is hurt by "flyrock" (blast debris). Wind protestors are on the Nelson's property, and they refuse to move for the blasting. After all, they are on private property by invitation. Nelson's attitude is that he never gave anybody permission to spread flyrock on his property anyway. It has ended up in court (of course). Terri Hallenbeck of Burlington Free Press has an excellent article on the situation. 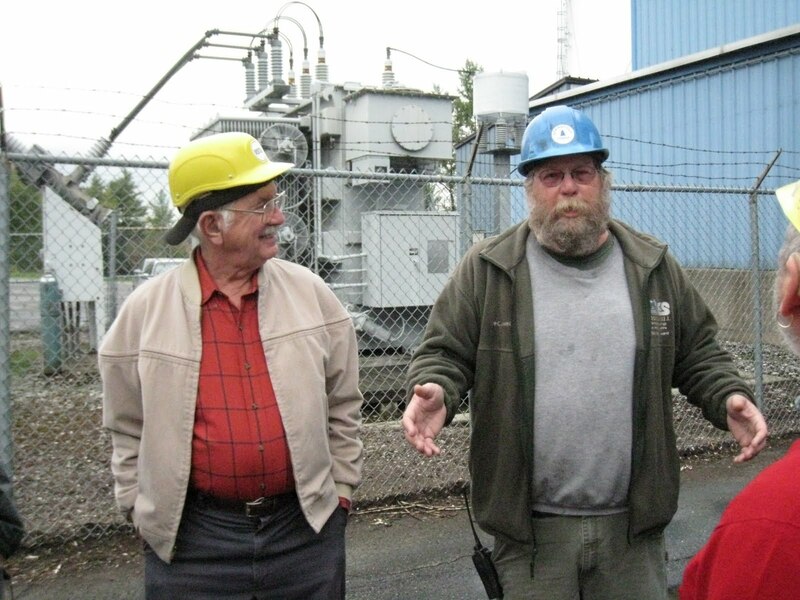 Green Mountain Power first told the Nelsons they would be sued for the cost of delays. The threat was a bit of a public relations nightmare, of course! Next, Green Mountain Power offered to buy their land. So far, the Nelsons have not budged. Two quotes from Don Nelson, from the Hallenbeck article:“After 40 years of working, if you had to sell to someone who wanted to destroy what you built, would you?” asked Don Nelson, who grew up on the property and raised his family there....(Green Mountain Power sent) a letter to the Nelsons warning them that Green Mountain Power would take them to court and hold them financially responsible for the cost of any delays caused by the campers on the ridgeline. The Nelsons characterize that as a threat to force them into selling. 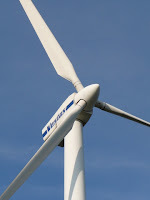 Meanwhile, my friend Willem Post has an excellent article in Energy Collective: Was Vermont's Lowell Mountain Wind Turbine Facility a Good Idea? His answer is no, considering both cost and environmental impact. When I show up somewhere with a pro-Vermont Yankee sign, and I try to convince an opponent that nuclear is safer and better than fossil, the opponent is sure to tell me that "We don't need either fossil OR nuclear. We can meet our energy needs with renewables!" Sometimes I wonder if the opponents actually live in Vermont. On September 14, The Department of Public Service (DPS) released a 600 page Comprehensive Energy Plan (CEP) for Vermont. The plan was long, vague, and internally inconsistent. Instead of tacking the whole thing, environmentalist Chris Matera studied a defined chunk: the plan's recommendations for increased use of biomass for electricity production. Matera wrote an opinion for the Bennington Banner titled Vermont's Plan Misses the Forest. He describes how burning wood for electricity causes air pollution, generates carbon dioxide, and causes deforestation. He asks: So how did increased cutting and burning of forests (called "deforestation" and "pollution" when it occurs in other countries) get re-branded as "green" energy..?." The CEP sections on woody biomass were confusing. On some pages, the CEP seems to expect only about a 30% increase in electricity from woody biomass in the near future. On nearby pages, the CEP describes "25 x'25", a plan to produce 25% of Vermont's energy by biomass fuels by 2025. Two years ago, the state legislature convened a biomass working group. The group is supposed to report its results on biomass utilization to the legislature in 2012. It is typical of this administration that it is rushing to adopt the Comprehensive Energy Plan before receiving that report. Is There Enough Biomass, Anyway? 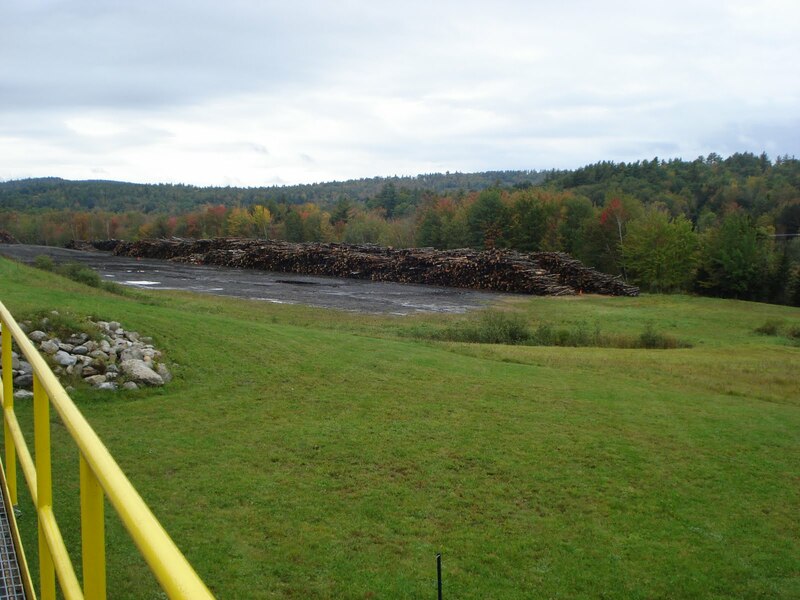 Instead of trying to decipher the CEP statements on biomass, let's look at real examples of biomass plants, and what it would take to expand this type of electricity production in Vermont. The Springfield Power LLC biomass plant in Springfield New Hampshire is visible to people who drive south on Interstate 89. It is located at exit 12A, not far from New London. The plant makes 19 MW of power, and runs most of the time, only shutting down for maintenance. It sells its power at about 5 cents per kWh, while paying around 4 cents per kWh for its wood. The Springfield plant is well-equipped with NOx and particulate control, and sells its fly ash as a garden amendment. It also sells Renewable Energy Certificates, and therefore is profitable to run. I visited it with the Energy Safari class. Bob Hargraves wrote a very comprehensive blog post on our visit. The Springfield plant burns 200,000 tons of wood to make 20 MW of electricity. This about 100,000 cords of wet wood (2 tons per cord).). Chuck Theall, the plant manager, says that the plant calls the grid operator daily, and promises to supply energy. The grid counts on his energy, and if the plant does not operate, it has to pay for replacement power. Wood-burning plants are heat engines, which means they can be reliable baseload plants, like Springfield Power. The ability of a wood-burning plant to supply baseload power is in sharp contrast to solar and wind renewables, and makes expansion of wood-burning very attractive for an all-renewable energy plan. How Much Forest Per Megawatt? In terms of power production, the Springfield plant is tiny. Vermont Yankee makes 620 MW of power. It would require 31 Springfield Power plants to replace Vermont Yankee on the grid. How much forest would this require? I did research on sustainable forest yields. I could not find answers in a book, so I asked local foresters: "What is the sustainable yield of firewood for an acre of Vermont forest?" I learned that foresters hate to answer general questions about "Vermont forests" because "Every bit of forest is different." Eventually, I found an approximate consensus: One-half cord per acre is a sustainable yield for most of our forests. As a child, I learned the mantra that you could harvest a cord of wood each year from an acre of forest. Vermont foresters agree that that number was too high. A quick calculation (100,000 cords per year, half a cord per acre) shows that the yield from 200,000 acres is required for a 20 MW plant. To give some context to this number, the entire Green Mountain National Forest is 400,000 acres, and the state of Vermont is 6,000,000 acres. It takes the equivalent of half the harvest of the Green Mountain Forest to make 20 MW of electricity. To make 31 times this amount of electricity, to replace 620 MW of Vermont Yankee with woody biomass power plants--this would mean the entire state would be devoted to raising wood to burn. Six million acres wouldn't even be quite enough. Expanding our current wood-fired electricity production will be difficult, but not impossible. Replacing Vermont Yankee with wood-fired plants is impossible. Going "25% by 2025" for electricity through woody biomass is close to impossible, especially since power plants must compete with homes and schools for firewood. In the long run, our forests are our joy. Our forests are our foliage season. Our forests eat carbon dioxide from the air, and even sustainable harvest will affect this to some extent. We can add some wood-fired electricity in Vermont, but not much. We cannot get one-fourth of our electricity from our forests. We need to be mindful of competing uses for our woodlands. And so, we return at last what Matera said in his op-ed: So how did increased cutting and burning of forests (called "deforestation" and "pollution" when it occurs in other countries) get re-branded as "green" energy..?" Picture of Chuck Theall of Springfield Power, and Neil Daniels, retired engineer, courtesy of Bob Hargraves, from his post on the ILEAD visit to the Springfield plant. True North Reports published a more complete version of this article. I thank Rob Roper and True North Reports for the opportunity to reprint the article on my blog. Picture at upper left is part of the wood pile: approximately two weeks worth of logs, and logs are approximately 1/3 of the wood used. The rest of the wood is delivered as chips. This post also grew out of an earlier Yes VY post about the biomass plant, specifically from the comment section of that post. Occupy Vermont is active in Burlington Vermont, as Occupy movements are active in many states. As usual, however, Vermont is different. Reading the newspaper reports, it seems that Occupy Vermont is now about Shut Down Vermont Yankee. According to WPTZ, Occupy Vermont protesters marched through Burlington chanting "Vermont Yankee has got to go." Shutting the plant down will decrease jobs in Vermont and export the jobs to New Hampshire and Quebec. Shutting the plant will achieve the exact opposite of the Occupy movement's goals. Yes, the goals are fuzzy, but there are goals. 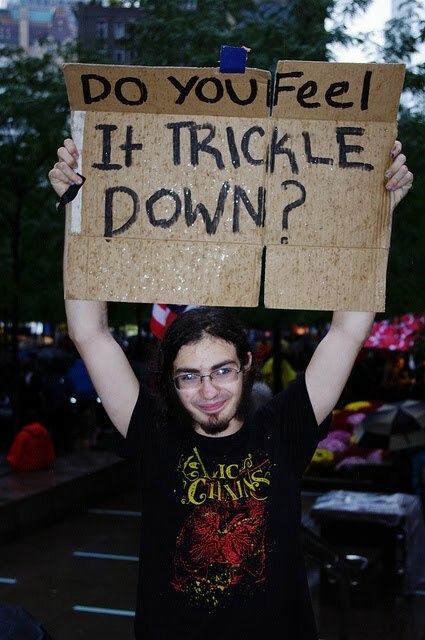 The Occupy movement wants decreased income disparity, lower unemployment and no bail-outs for the rich. However, Occupy Vermont been co-opted to the anti-nuclear agenda. Most Occupy movements want changed banking laws, increased economic stimulus measures, and income re-distribution. In Vermont, the anti-nuclear movement provided Occupy Vermont with something easier to achieve. The anti-nuclear movement provided the Occupy movement with....a scapegoat. In my opinion, fear of nuclear is today's opiate of the people. Politicians don't have to worry, as long as there's a nuclear plant around. Keep people busy marching against a nuclear plant, keep the anti-nuclear rhetoric flowing...and people won't notice rising prices, rising taxes, and falling wages. People won't notice that teachers are being laid off, that unemployment is becoming endemic, that bankers get bonuses with taxpayer money...as long as they have a nuclear plant to protest! Was Co-Option of Occupy Vermont Inevitable? Occupy Vermont didn't have to go this way. The Occupy movement has been widely criticized for having fuzzy goals. Indeed, that makes it easy for well-organized groups with clear agendas to co-opt the movement. Still, this co-option has happened in this state because anti-nuclear groups in Vermont are so well-funded and so willing to step into any gap. It didn't happen in other areas. 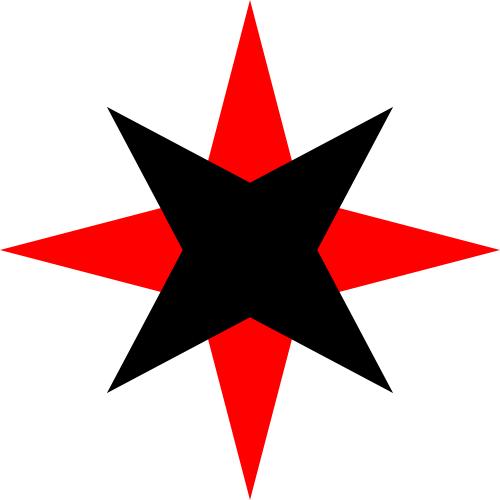 I am aware that what we usually hear about the Occupy movement is about violence and brutality, mostly on the West Coast. I want to compare Vermont's movement, however, with some other East Coast movements. The video below is from the Occupy Boston movement. Occupy Boston is holding a series of lectures, the Howard Zinn lectures. This video is part of that lecture series: a talk given by Vijay Prashad on October 25. Prashad went to several East Coast Occupy sites and asked what their issues were. The goals varied by city: unemployment, hunger, student loans. (This is described in the first five minutes of the video clip.) In other words, the Occupy movement responds to local problems. 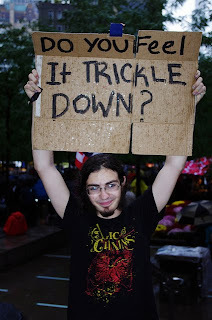 I am not endorsing their solutions, but the Occupy movement does want economic betterment for ordinary people. Right here, Vermont's middle class is embattled, with long-term unemployment, layoffs, and high heating oil prices affecting everyone. (The Burlington Free Press has an excellent article on Vermont's Shrinking Middle Class.) In our neighboring state, New Hampshire, hospitals are refusing to take Medicaid patients. Things are going badly in our corner of New England. Meanwhile, our Occupy Vermont movement has been co-opted by the anti-nuclear groups! They want to shut down one of the premier economic engines in the state, and cause wide-spread poverty in the southern half of the state, and widespread rejoicing in Canada. Sometimes I think Vermont can't get anything right, even protest! We need to break the stranglehold of anti-nuclear groups on the public discourse. We need to Change Vermont for the better, not for the worse. We need to build the middle class, not destroy it. In other words, we need Vermont Yankee to keep operating and keep employing Vermonters. A reminder. Comments on the Comprehensive Energy Plan for Vermont are due by 5 p.m. tomorrow. You can use the following email address to comment on it. An earlier blog post contains several references that might be helpful in writing your comments. The plan is long, but your comments can be short! Be sure to comment. The plan's length and inconsistencies remind me of the saying: "If you can't blind them with brilliance, baffle them with bull droppings." Luckily, other people have analysed the plan. If you take advantage of their work, you can get a reasonable comment written in short period of time.